Blisters are small pockets of fluid within the upper layers of the skin, typically caused by forceful rubbing or friction. Most blisters are filled with a clear fluid called serum, though some blisters can be filled with blood. Blisters can be caused by either rubbing or friction caused by ill-fitting footwear or footwear that is too small or tied too tightly. It can also be caused by socks that retain moisture and rub against the skin. Foot ailments such as bunions, heel spurs and hammertoes can also cause blisters. If the blister is not painful, try to keep it intact as unbroken skin over the blister provides a barrier against bacteria and prevents infection. Cover the area with a bandage or adhesive tape. 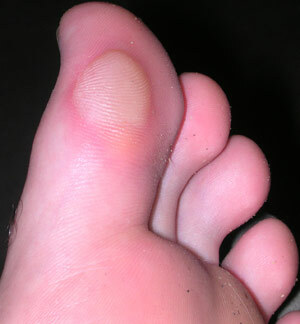 If the blister is painful, you can drain the fluid from the blisters while leaving the skin intact. Use the needle to puncture the blister. Aim for several spots near the blister's edge. Let the fluid drain, but leave the overlying skin in place. Apply an ointment (Vaseline, Plastibase, other) to the blister and cover it with a nonstick gauze bandage. If a rash appears, stop using the ointment. Change the dressing every day. Apply more ointment and a bandage. Use Spenco Blister Kit or Body Glide products. Use socks that will wick or move moisture away from your skin while working out. All of the socks that we carry at Fleet Feet Sports – Balega, Smartwool, Feetures, and CEP – are excellent at moving moisture away from the skin and keeping your feet dry. Make sure your footwear fits properly. Meet with a Fit Associate to choose footwear that fits correctly.